It is said that all architects are frustrated artists, but Michael Bottomley must be the exception to this rule, as he seems by both the standards of quality and fecundity to be a very fulfilled one. Alongside his remarkable and visible professional career has run another less openly visible but equally industrious amateur one. The word is used here not in its modern pejorative sense of something poorly done but in its earlier sense of something done for enjoyment rather than payment. Each year, his practice was to exhibit three watercolours (the maximum allowed to members) at the Kendal Art Society and around half a dozen at the Lake Artists’ Society in Grasmere. The watercolours were developed from sketches drawn either on trips made in connection with his architectural work in Cumbria, or on visits to a wider area beyond his professional radius; his work therefore contained mostly views of Cumbria but also spread further afield into Yorkshire, down to Liverpool and Manchester and as far as Gloucestershire, the West Country and London. In most cases, each watercolour was signed and dated for inclusion in an exhibition; the watercolours in the annual exhibitions that did not sell he kept. Michael’s love of the masters of the English watercolour school, Turner, Girtin and particularly Cotman, is very clear. His studies of receding roofs and townscapes sometimes recall the now world famous studies of Neapolitan rooftops drawn by the Welsh artist Thomas Jones in the eighteenth century. But there is no hint of plagiarism. Michael’s vision is entirely his own. He brings his skill as an architect and his trained eye for perspective and line together to produce a unique treatment of a subject; his fascination with odd angles and juxtapositions results in a wholly individual product. Michael first exhibited at the Lake Artists’ Society in 1947 (he never parted with that first exhibit) and was elected a member in 1948. 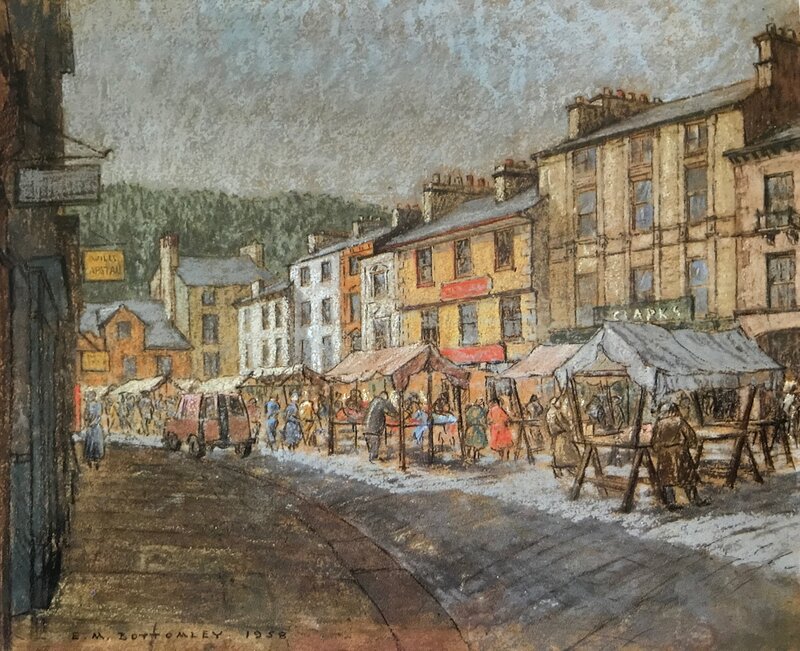 From 1949 he exhibited at the Kendal Art Society, of which he was Secretary for fifty years between 1957 and 2007. Both as a solo exhibitor and with other artists, Michael also exhibited at many other smaller venues all over the north of England and elsewhere. In 2008, Michael published A Kendal Sketchbook, which brought together drawings and watercolours of the historic town done over a period of fifty years, accompanied by a concise and illuminating text; this was brought out in conjunction with Kendal Civic Society, of which Michael was a founder member.